Have you ever looked at a piece of art and wondered what was in the mind of the artist as they painted their picture? We may look and wonder what was in the Creator's mind when He put the world together. We have access to the Master Artist. You can read my previous post THE ARTIST OF ARTIST to find out who He is. He has given us His journal so to speak that we may know Him and what He was thinking. That is why my husband and I love putting scripture on our pictures. 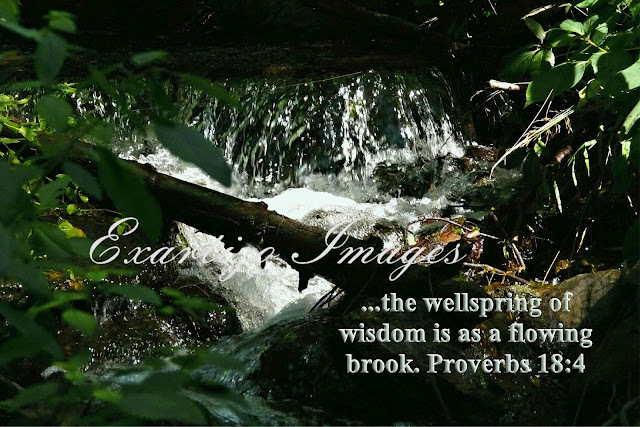 This particular scripture seems made for this photo that was taken while on one of our many nature hikes. Proverbs is one of my favorite books of the Bible. Why? Wisdom.. I crave to know His. The world is full of problems and at times those problems seem to want to dominate every aspect of life. Everyone has an opinion as to how to handle all the crisis's going on in our world. When it gets overwhelming with every one's opinion, stop, find a place of quiet. Get out the great book and seek His wisdom. He has the answers for your situation. Most of the time you can find the answers you need directly in the scriptures. While you are reading, you can ask Him for additional guidance for your particular situation. How do you know when it is His wisdom? The wisdom may not come right then and there. It might come while you are taking a walk, or sitting watching people in a mall, or riding a bike. The Lord is personal. He knows you and how to best how to communicate with you. One of my favorite accounts that shows a need for wisdom is in Matthew 17:24-27. Get out your bible and read the account. Peter needed wisdom for the situation. What I love most is Jesus' KINDNESS. Jesus was thinking of the temple tax collector's. He did not want them to stumble. He gave Peter the wisdom needed for the situation. We may not be able to change the world's problems, but if we follow the Lord's example in our own lives and walk with wisdom, my guess is the world's problems won't seem all that important. Enjoy His creation today and seek His wisdom. What a lovely picture! You're right, all we need to do is listen with our hearts for the Lord to speak his wisdom to us.